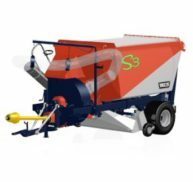 The new S3 vacuum sweeper is the latest to compliment the range of Trilo machines and is a versatile adaptable machine which can be used all year round. 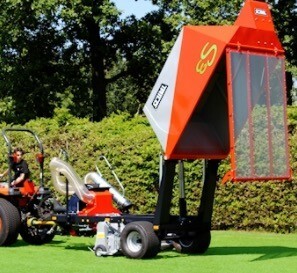 Trilo are the leading manufacturer in the vacuum sweeper market and the latest model will deliver a professional easy collection of grass clippings, leaves and litter. As with all Trilo machines, the high standard of manufacture and design specification allows not only ease of use, but also means less time spent on routine maintenance allowing more time in the field and less spent in the workshop. Trilo products have a proven longevity with lifetimes in excess of ten years being commonplace. The all new trailed Trilo S3 can be driven by a compact tractor, yet has a large 3 cubic metres capacity container. 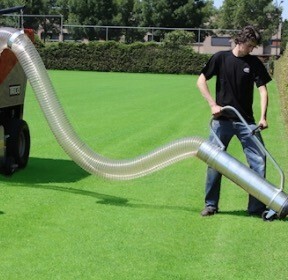 The 1.5 metre full floating brush head and low ground pressure allows the machine to work under the heaviest of conditions where others may struggle. The heavy duty fan has an inspection trap in the lower part of the housing enabling easy cleaning. The 5 metre easy to use wanderhose has a 200mm diameter and allows easy cleaning of confined or restricted areas such as bunkers, shrubberies or refuse bins. The high tip container allows tipping into a skip or trailer. Required hydraulics: 180 bar – 20 l/min.